On October, 24 2010, the Annapolis Valley Trips for Kids Chapter participated in Fall Fest at the Links. Fall Fest was a fundraiser for trail construction and maintenance for the trails on Burgess Mountain, just north of Woodville. 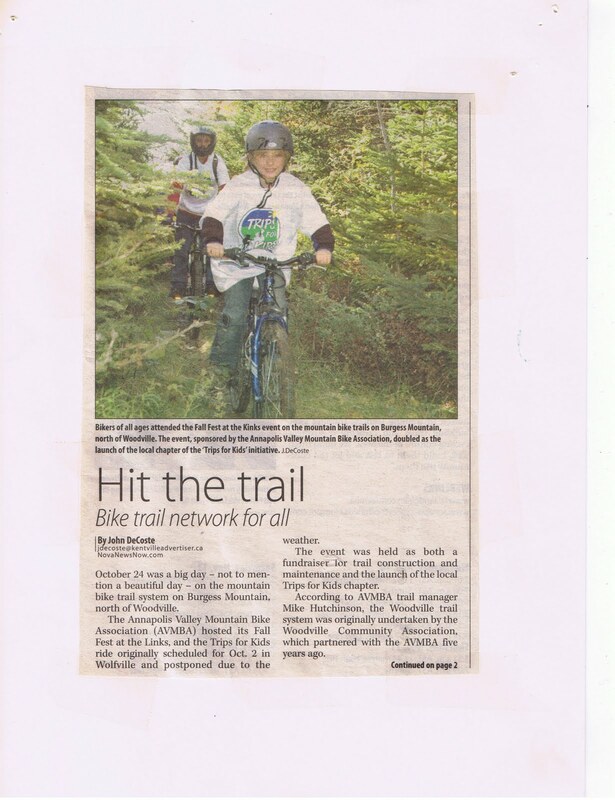 The event was organized by The Annapolis Valley Mountain Bike Association (AVMBA) and was a huge success with a major turn out logging 130 volunteer hours and raising over $500 for future trail work at the Links. Based on Fall Fests success in October, it looks like it will become an annual event hosted by The AVMBA. 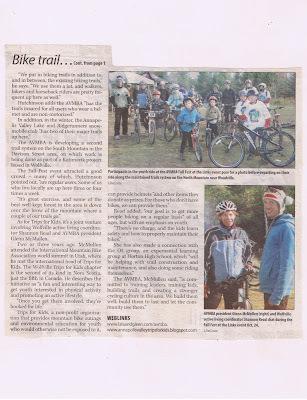 Kids enjoyed guided group rides, and a wonderful BBQ. Trips for Kids looks forward to participating again the years to come. The following article was published in The Advertiser, by John DeCoste. SAN RAFAEL, Calif. - January 10, 2011 - Trips for Kids, the national organization that inspires youth outdoors on mountain bikes, inked a sponsorship agreement with CST for 2011. The company's contribution of $7,500 provides essential support to 70 Trips for Kids chapters across North America. "We are truly looking forward to continuing our partnership with Trips for Kids in 2011. Their organization is essential to the future of our cycling community," says Jennifer Biggers, assistant manager of the Specialty Division at CST-USA. "We are very enthusiastic about the partnership between CST and Trips for Kids. It makes it possible for us to reach out to the biking community and expand our programs," says Eric Goldman, executive director of North America at Trips for Kids. CST increased its support of Trips for Kids last year after continued support of the organization since 2001. "During these difficult economic times, it's companies like CST that enable us to continue making a difference in the lives of at-risk youth," says Founder Marilyn Price. Offering high-value, high-quality tires for bicycles, ATVs and motorcycles, CST has operations in Canada, China, Dubai, Germany, Japan, the Netherlands, Taiwan, Thailand, the United Kingdom, the United States and Viet Nam. In North America, CST is headquartered in Suwanee, Georgia. Trips for Kids (www.tripsforkids.org) is a nonprofit 501(c)3 organization based in Marin County, California. With 70 chapters operating in the United States, Canada and Israel, Trips for Kids opens the world of cycling to at-risk youth through mountain bike rides and Earn-a-Bike programs. TFK rides are the "vehicle" through which the kids gain confidence, skills, and an appreciation for nature. TFK's after-school Earn-a-Bike and job training programs teach kids how to build and repair bikes, while they learn the values of responsibility, patience, and hard work. 2011 Trips for Kids - Annapolis Valley. Watermark theme. Powered by Blogger.